“Paddington” (2014) was not dark, not exactly, but it did feel a little more sinister, given Nicole Kidman’s comically menacing turn as well as allusions to Jews fleeing the Nazis. “Paddington 2”, however, while overtly nodding to the reactionary attitudes prevalent in many parts of the world these days, including, obviously, Britain, remains firmly on the sunny side of the street, not so much ignoring the narrative infiltrating sadness as heroically overcoming it. That victory for happiness is connected to Paddington himself, the storybook bear (voiced by Ben Whishaw with maximum earnestness) who, when last we saw him, had become spiritual caretaker to the Brown family, and they to him. Paddington might hail from the Darkest Peru, but his worldview feels born as much from Seattle – that is to say, from Lloyd Dobler, who once memorably asked “How hard is it to decide to be in a good mood and be in a good mood?” Not that hard if you’re Paddington. Not even when things go awry, which they do often, like a madcap window-washing stint, an impeccable comic set piece evoking Buster Keaton. Such an evocation might well be a nod toward the adults watching, but also works as an important tutorial to kids that movie action can be wrung from precise choreography and editing as much as overwhelming special effects and loud noises. That Paddington finds himself window washing is connected to his yearning for a paycheck to purchase an expensive, precious pop-up book for his beloved Aunt about to turn 100. The pop-up book, however, does not merely lie on the table, brought to life in a sequence where Paddington imagines showing his aunt the sights of central London, one occupying the thin melancholy line between mere dream and a manifestation of making your dreams come true. That manifestation becomes more difficult when it turns out the pop-up book doubles, as these things do, as a treasure map, a treasure lusted after by chief villain Phoenix Buchanan (Hugh Grant). No role, I dare say, in Grant’s canon has so exactly matched his aptitude for mixing charm, comedy, and imperiousness quite like Buchanan, a washed-up theatre actor who nevertheless oozes vainglory. Grant evinces this throughout, most hilariously in a television commercial where he dresses in a man-sized canine costume to pitch dog food, imfusing the sequence with hilarious misplaced confidence as opposed to tail between legs shame. A later moment in which the character rues forgetting his cravat might be a narrative trigger for a subsequent scene, but Grant emits a droll, believable air of self-absorption, as if he meanders down the street entirely within the confines of his own head. This narcissism is deliberately contrasted against Paddington’s selflessness, stressed in the egotistical actor framing Paddington for the book’s theft and then leaving the bear to rot in jail. If this twist sounds harsh, it both is and isn’t. If there is a genuine melancholy that comes with Paddington being separated from the ones he loves, his intrinsic personality gradually infuses his fellow prisoners. That infusion is literally and figuratively tied to the sweetness of his preferred marmalade, which becomes something like an inadvertent statement of purpose, helping to win over even the hard-nosed prison chef Knuckles, played by Brendan Gleeson with a humored gruffness that is not so much a grizzly bear with teddy bear tendencies as a grizzly bear who gives respect where it’s due. And when Paddington messes up the prison laundry by way of a single red sock, causing the standard black and white uniforms to emerge pink, this color change evokes the clink’s eventual attitude change, one given voice by the movie’s Calypso band Greek Chorus espousing for everyone to love their neighbor, a contemporary, Caribbean update of Sesame Street’s immortal “Co-operation Makes It Happen”. Paddington’s sentencing, meanwhile, also allows the Brown family to bond over attempting to prove their beloved bear’s innocence. 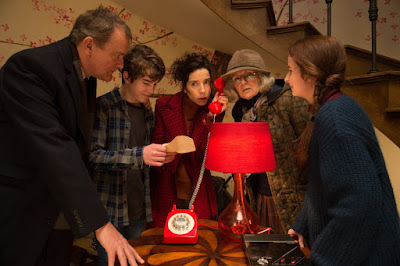 If Sally Hawkins was not afforded the opportunity to do much in the original other than offer encouragement, here she gets to step it up, as Mrs. Brown becomes a sort of Sherlock, declaring her intent to “sniff out anything suspicious”, a line reading that Hawkins invests with so much in the moment glee that the sheer vocal elan will make you laugh out loud. Mr. Brown (Hugh Bonneville, rigid comedy gold), on the other hand, initially comes across like a more hesitant Watson. Indeed, if the first “Paddington” centered on Mr. Brown’s transformation from risk-averse to gallant risk-taker, here his being passed over for a work promotion triggers mid-life crisis. His corrective is community, embodied in his and Mrs. Brown’s quest to unmask Phoenix Buchanan as the real thief. And if you couldn’t really have a Paddington movie without Paddington (and why would you want to? ), the rock solid chemistry between Hawkins and Bonneville nevertheless suggests the Browns are their cuddly co-star’s equal. A scene where they break into Buchanan’s home to prowl for clues might be based in timeworn tropes, but the byplay, timing and all-around enthusiasm of the two actors (and Grant) gives it a farcical kick that involuntarily will curl your lips into a joyous grin. 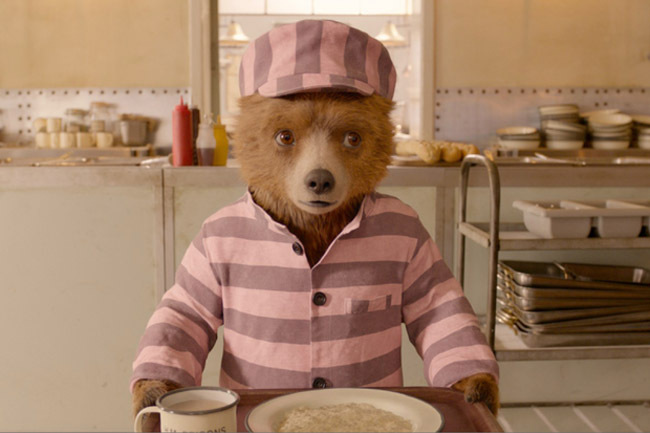 Still, prison is where “Paddington 2” truly shines. Our bear might be betrayed a few times throughout, but, in a Ferris Bueller-ish sort of way, he is a character not so much about change as he is about just sort of innately imbuing everyone around him with his own spirit. And if community is essential to “Paddington 2’s” makeup, so ultimately is rehabilitation, not just when it comes to Knuckles and company but Phoenix too. Closing credits sequences, particularly those passing on relevant information, have never been my bag, since if you have something to say you should simply be able to say it before the movie officially ends. Yet the post-conclusion sequences of “Paddington 2”, not to be revealed, is truly (and sonically) righteous, its after-the-fact narrative position emblemizing how everyone has the chance to write a second act so long as they seize the opportunity. Great review my friend. I love these damn movies too. You're right, Part 2 really does shine during the prison sequences and that after credits number was indeed righteous. I'm no fan of after credits scenes either, but this one sold me and then some.